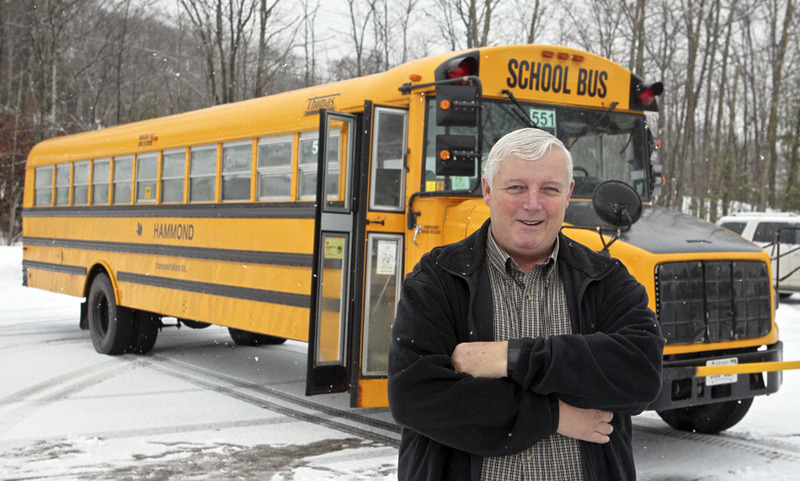 Although retired as an owner, Ed Slater continues to drive a school bus. After more than 40 years of driving Parry Sound’s back roads, Ed Slater knows Orrville like the back of his hand. He knows when a bend in the road is coming up, which potholes to avoid and which spots can get extra slippery in the winter. He also knows exactly how long it takes to drive from one road or driveway to the next – for Slater, it’s his job. For nearly every weekday since Slater was old enough to get his bus license, at 21, he’s made sure area children get to and from school safely. For 20 years, Slater would work at the Texaco gas station in Orrville in between his runs. After five years of driving a Slater school bus for his father, he took over the business, and ran the three busses that serviced Orrville for the next 35 years. Growing up as the only boy in the family, he knew he’d eventually follow in his father’s footsteps. His goal was to keep the buses running until he was 60. Now 62, Slater decided selling the bus company was a chance to offload some responsibility. The three buses, now owned and run by Hammond Transportation, have the same three drivers, including Slater, who said he’s not ready to give up his spot behind the wheel just yet. “My license is good until 2013, so I’ll have to see if I’m going to rewrite it,” he said. He’d once promised himself that he wouldn’t drive for anyone else, but now he’s easing into his new role. There are more demands on school bus drivers than years ago, making it harder for smaller companies to keep up, said Greg Hammond, secretary and treasurer for Hammond Transportation. Hammond’s father and Slater’s father were good friends for years, making Slater no stranger to their business, which is also family-owned. Still, Slater follows the same morning routines he’s always had when he gets up each morning. At 5 a.m., while Orrville’s students are still sound asleep in their beds, Slater is up to check the road conditions before he starts getting ready to leave. In winter checking out the roads early is always a must, he said. Next, he completes a circle-check around and inside the bus and turns on the engine for a few minutes of warm up before it’s time to go. In the meantime, he’s busy checking the buzzers, emergency windows and under the hood. Making sure he leaves on time is essential. According to Slater, when the weather looks rough, the bus drivers and operators need to decide to cancel their routes by 6 a.m. If weather reports are accurate, the drivers usually know the night before. Years ago, when there were more bus operators in the area, the drivers and operators formed a pyramid of communication, to discuss bad weather – the calls would start around 5:30 a.m. The drivers, who were still paid for their day of work, then called each of the riders’ parents about the cancellation, which took around a half hour. Now, he said, the final decision to cancel routes is made by the school board, which then notifies the radio stations. Still, there are times when plain common sense is required out on the road – and with a bus full of kids – a little concentration doesn’t hurt either. “Teachers think they’ve got it bad – they’re standing looking at the kids – but we’re trying to keep the vehicle on the road,” he said. “You just drive with the conditions like everyone is taught,” he said, explaining that sometimes it’s clear until 7 a.m. then the snow starts to fall. Getting students to school safely is the first priority, but Slater is also sure his patrons view the bus as a comfortable environment. Bullies beware, it’s not tolerated on Slater’s run. Back when Slater started driving, if a child was causing a problem a driver didn’t have to think twice about stopping the bus and asking them to get off. Now, they’d lose their job. Slater said he prefers to deal with problems with students head-on, keeping open lines of communication with parents. Slater can’t even remember the last time he’s documented a student to the school for bad behaviour. Larry Klose, who’s also lived in Orrville his entire life, said the community can depend on Slater to keep their children safe. Klose said he played softball with Slater as kids, and as a reputable pitcher, the kids dubbed Slater “Steady Eddie”. “He was a fun guy – and as far as I know, he still is,” he said. Now, Slater said it’s not uncommon for him to drive the grandkids of students he drove on the bus years ago. By now, though, too many kids have gotten on and off the bus to remember them all. When he’s not driving the bus, Slater is usually found on the golf course. Now, without a business to manage, Slater said he’s got more time to spend perfecting his golf swing. Over the years, he’s met other golfers and created a foursome he enjoys golfing with. Eighteen years later, they’re still heading out to the course together. With more free time on his hands Slater is also taking the time to vacation with his wife. This winter he and his wife spent some time in Florida, where they plan to revisit next year. They’ve also got a trip to Vegas on the books.